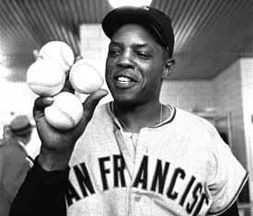 On April 30, 1961 at Milwaukee’s County Stadium, The San Francisco Giants scored fourteen runs against the Braves and eight of them belonged to Willie Mays. The “Say Hey Kid” put on a dazzling display of power by going deep in the first, third, sixth, and eighth inning. Mays later credited the fact that he used teammate Joey Amalfitano's bat during the game for his stunning display of power. His sixth inning homer cleared the left field bleachers and left County Stadium. After hitting his fourth home run in the eight inning, Mays was on deck in the top of 9th when the third out was made, ruining his chance at five homers. Asked after the game about his incredible achievement, Willie answered nonchalantly: "It's not hard. When I'm not hitting, I don't hit nobody. But, when I'm hitting, I hit anybody." According to Sportswriter Harry Jupiter who reported on the game for The San Francisco Chronicle "No record book reflects this kind of concentration, determination, perseverance or ability. As a player, Willie Mays could never be captured by mere statistics….but hitting four homers in a single game pretty much says it all."